Among the early land plants in the Lower Devonian Rhynie chert, Ventarura is distinguished by a peculiarity: rapid decay of tissues except for a fraction of cortex (Fig.1). 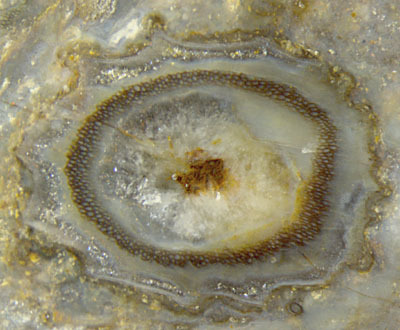 The latter is often but not always seen on cross-sections of aerial axes as a surprisingly well-preserved enigmatic ring of cells but the epidermis has apparently not been seen hitherto, as can be concluded from quotations like "... cells directly internal to the cuticle are not preserved" and "... an unequivocal epidermal layer was not observed ..." . This is confirmed by "... an epidermal layer has not been seen ..." . In view of the fact that the epidermis is seen on all other land plants in the Rhynie chert, often very clearly, one could suspect that its absence in the silicified aerial axes of Ventarura might be restricted to the one large chert pod which the publication  is based on. Judging from several hundred Ventarura sections seen on more than a dozen own chert samples which apparently represent a wider variety of fossilisation conditions it can be stated that the epidermis is really almost never seen on Ventarura aerial axes. One such is seen in Fig.2. By lucky incidence, this specimen offers sections of epidermis cells in three mutually perpendicular planes. 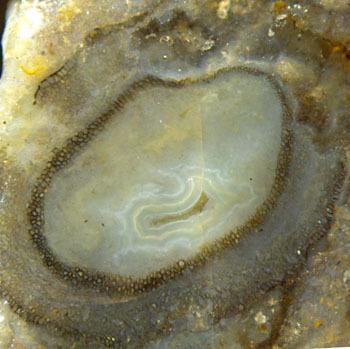 Fig.1 (above): Ventarura cross-section, typical aspect: well-preserved ring-shaped fraction of cortex, shrivelled surface, quartz-filled cavities replacing decayed and vanished tissue. (There is no central strand left. The brown spot is a deposit of iron ore between quartz.) Width of the picture 6mm. Fig.2: Ventarura cross-section on the raw chert surface, unique aspect with patches of epidermis and faintly seen outer cortex in addition to the conspicuous mid-cortex, no inner cortex and central strand left. Large diagonal of the section 6mm. Same chert sample as Fig.1. The unique cross-section in Fig.2 with patches of tissue other than the characteristic ring in mid-cortex has been found on the raw surface of a small sample of 38g among sections of "normal" aspect as seen also on the raw surface and on the cut and polished faces (Fig.1). 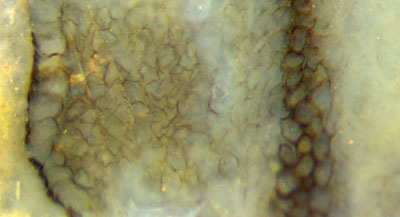 The enlarged view in Fig.3 shows clearly the epidermis at the bottom of the picture, slightly wavy owing to slight degradation and shrinkage of the outer cortex. Fig.3 (right): Ventarura tissue layers: epidermis, slightly degraded outer cortex, well preserved mid-cortex, vanished inner cortex. 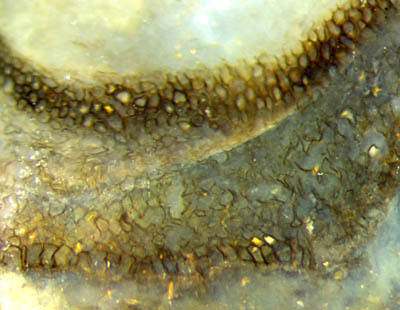 Detail of Fig.2, width of the picture 2mm. There is no indication of a reason why only in this particular case some patches of the epidermis are in a similar state of good preservation as the mid-cortex, the latter being an enigma in itself. From the aspect of the slightly degraded outer cortex it can be concluded that cell sizes and their variation are essentially the same as in mid-cortex. These observations are confirmed by Fig.4. 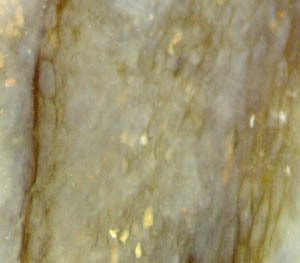 Fig.4 (left): Ventarura tissue layers, left to right: cuticle with black deposit, epidermis, slightly degraded outer cortex, well preserved mid-cortex, vanished inner cortex. Detail of Fig.2, width of the picture 1.3mm. As a lucky incidence, the shoot seen in cross-section near the edge of one fracture face (Fig.2) appears in approximately lengthwise section beyond that edge, with a very small strip of epidermis seen in top view (Fig.5). 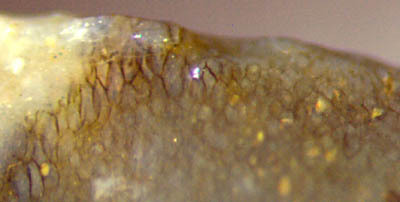 Fig.5: Ventarura seen from outside, epidermis seen as a small strip of lenghty cells on the left, broken off elsewhere so that the below cortex is seen there. Fig.6 (far right): Ventarura tissue layers, approximately lengthwise section, left to right: epidermis, degraded outer cortex, mid-cortex.